Dungeons and Dragons (D&D) is a table top role-playing game (TTRPG), meaning that the players assume the identities of characters which they design while responding and building on a story that is told by the game master, or GM. However, the world the players exist in is governed by rules, and those rules are set out in handbooks, which is why D&D is just one of hundreds of TTRPGs. While the rules vary greatly between systems, the constant between them all is rolling dice of some sort. 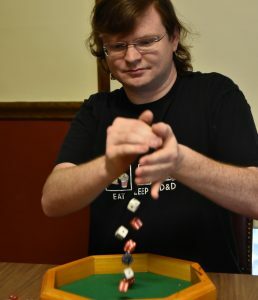 In incorporating dice rolling, TTRPGs add a random element to play which means that, barring extreme circumstances, the weakest character can always get a lucky hit and even the strongest character can botch a roll. In terms of rule books, the complexity of the rules varies greatly between systems. For instance, some systems have as few as three rule books, others have as few as one. D&D version 3.5 has nearly 300, though that number includes numerous adventure supplements as well as tangential material published under the version. Even then, the body of rules can be expanded out to Dragon Magazine, which itself had hundreds of editions, each with abilities of questionable balance that come up on optimization boards from time to time. The essence of a good game of D&D, or any TTRPG for that matter, is mutual engagement on the part of both the players and the GM. On the side of the players, there is a responsibility to be cooperative and helpful to the GM, even if it ends up hurting a player’s own character. I feel quite strongly about this point, because I am well aware that a player can use the rules as a cudgel to ruin a GM’s finely-laid plans. While this may be acceptable, even desired, it should only occur with the express consent of the GM. On the side of the GM, the expected courtesy is to not treat the experience of creating an entire world from nothing as an opportunity to lord that absolute power over others. D&D games only exist if a GM has players, and no one wants to live in a world with a spiteful god. Each version of D&D has its own distinct playstyle, both for players and GMs. The original system is AD&D/2.0, which is largely out of print, but can still be found on the internet. It is relatively confined and weighted towards melee classes. 3.0 and 3.5 are a monolith of sorts. While the versions are distinct, 3.5 updated old material from 3.0, some 3.0 material carried forward. This version takes experience and determination to master. While I strongly dislike 4.0, I will say it is as balanced as oatmeal, but can be decent if players want a game that is closer to a videogame than a TTRPG. N.E.X.T., or D&D 5e, is the best system for new players. It is relatively straightforward and well-balanced. While D&D might have started as a TTRPG, today the community is much bigger than a few groups on college campuses. Even when groups can’t convene in person, voice chat tools like Discord, and platforms such as Roll20 provide a strong platform through which campaigns can be continued over any distance. There are also massive conventions dedicated to the activities, such as Gencon, which often features cool new TTRGPs, and sometimes even the classics! There are forums where people spend days brainstorming how to make powerful and interesting characters through certain readings of the rules, and others where the community has created handbooks for virtually every class in the game, such as the Giant in the Playground forum. Whether you are completely new to the hobby or you put down your dice after high school, there are plenty of ways to keep playing and making new friends through TTRPGs.